During our last week in New Zealand we continued travelling the South Island. 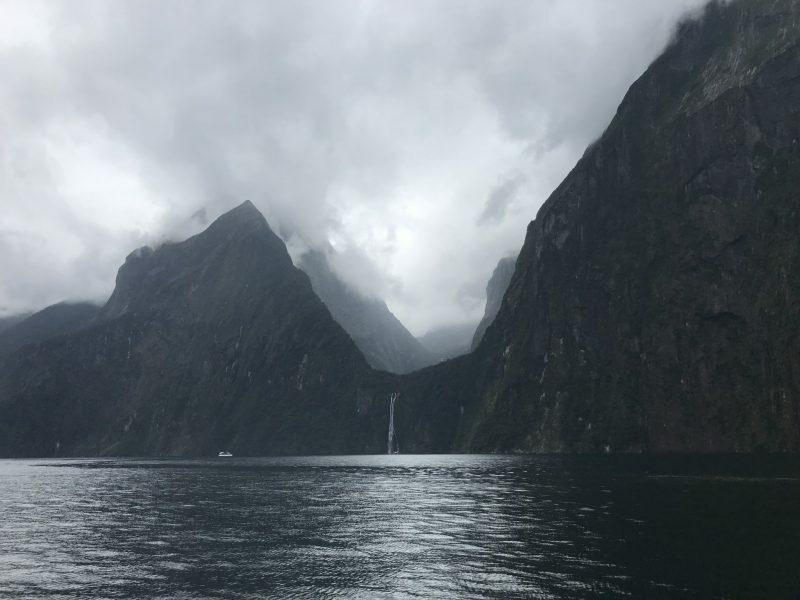 After staying in Queenstown for 3 days, we travelled to Milford Sound to do a fjord cruise. The last couple of days we spent around Mount Cook and in Christchurch. 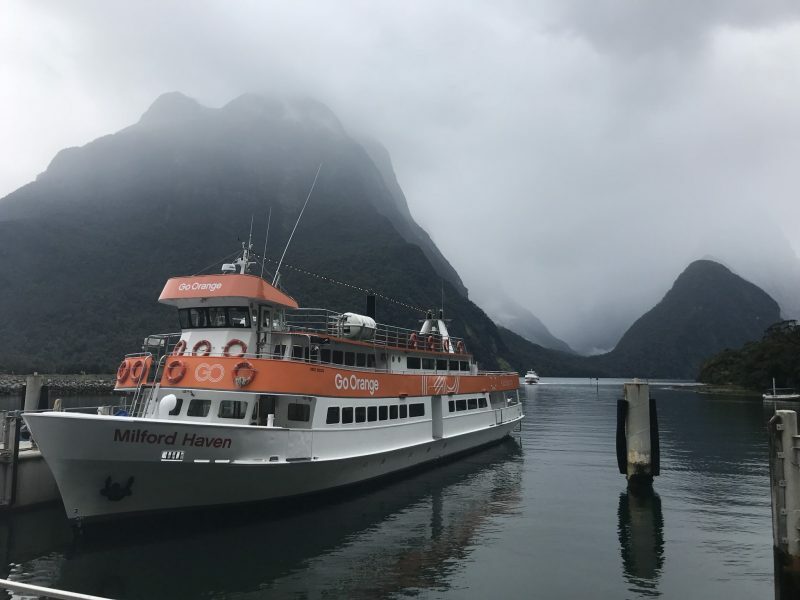 To get to Milford Sound, we travelled to Te Anau, the closest city to Milford Sound. There isn’t much happening in Te Anau, so we decided to only stay for one night and travel to Milford the next day. It takes about 2 hours to get there. The drive up is supposed to be very nice, but since we drove in rain and fog, we didn’t get to see that much. We had booked a 2 hour cruise with Go Orange for about €45 per person. At exactly 12 o’clock we embarked the ship and started our fjord cruise. Despite the bad weather, we still got to see quite a lot of the beautiful nature in Milford. The fjords were nice, but we can imagine them looking a lot nicer in beautiful weather. 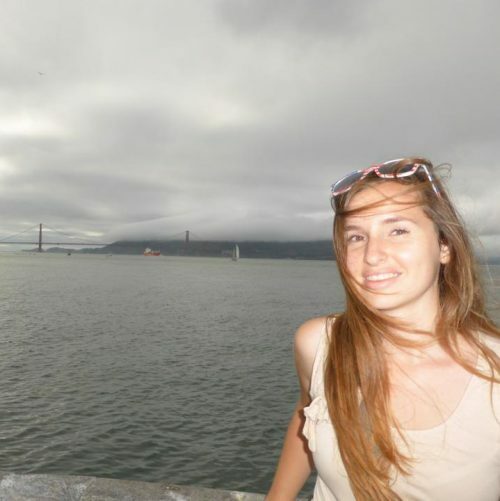 Also, after having been to Norway and seeing the Norwegian fjords, the New Zealand ones kind of pale in comparison. They weren’t as spectacular as the Norwegian ones. We did, however, get to see some nice waterfalls. After spending 2 full days in rainy Queenstown, we continued onwards towards Twizel. This area is known for its beautiful turquoise lakes and New Zealand’s highest mountain: Mount Cook. We started by driving along the shoreline of Lake Pukaki. 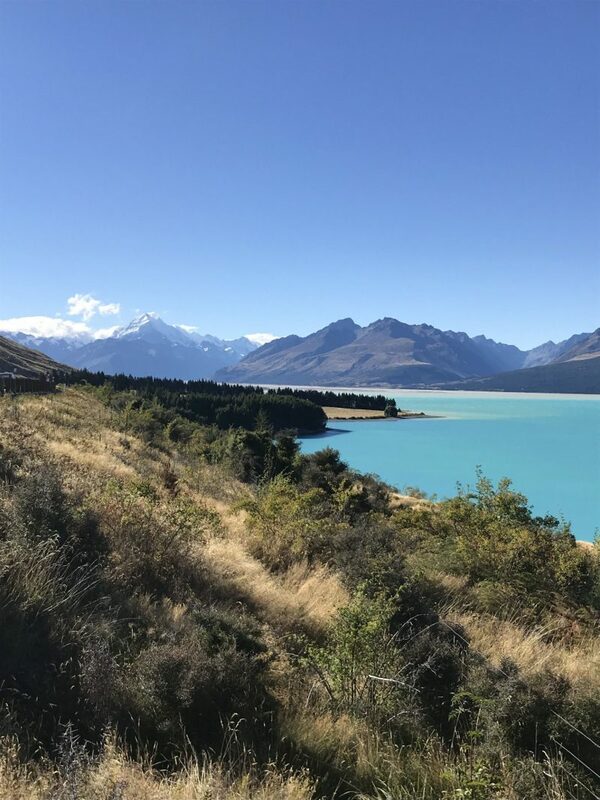 The turquoise water is really gorgeous alongside the yellow rolling hills of the Mount Cook region. We had to stop the car several times to take pictures! We drove towards Mount Cook, which was unfortunately completely covered in clouds when we got there. Therefore, we turned the car around and drove towards the Tasman Valley. 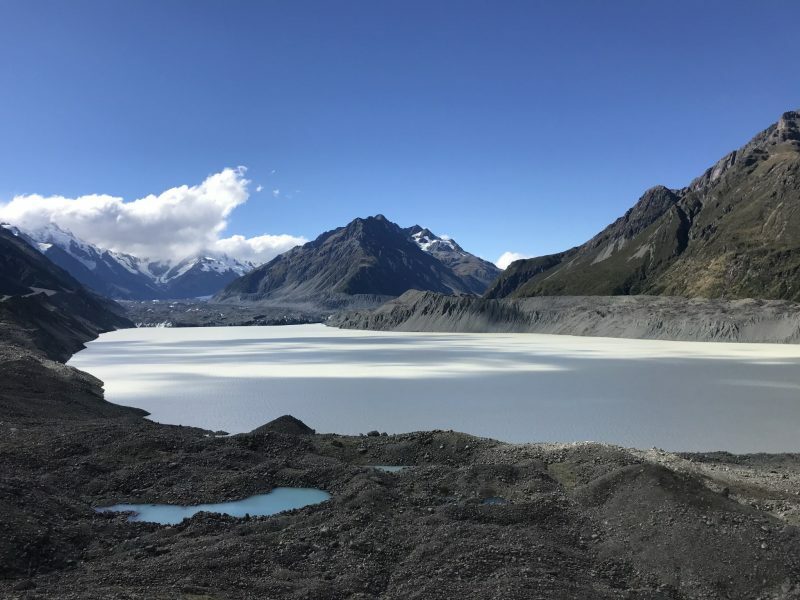 Here we hiked up to the viewpoint (only about 15 min from the carpark), to see a gorgeous glacier lake and a small hint of Mount Cook. Afterwards, we decided to drive back to Twizel. But luckily for us, suddenly Mount Cook broke through the clouds and we got to see an amazing view of Lake Pukaki with NZ’s highest mountain in the background. Another nice lake in that area is Lake Tekapo, which also has a beautiful turquoise colour. From here you can’t see Mount Cook or any of the Southern Alps, but it’s still a gorgeous place to stop. We went to the Observatory (8 dollars entrance) to get a good view and to have a tasty coffee. During our last day in New Zealand we went to Christchurch. 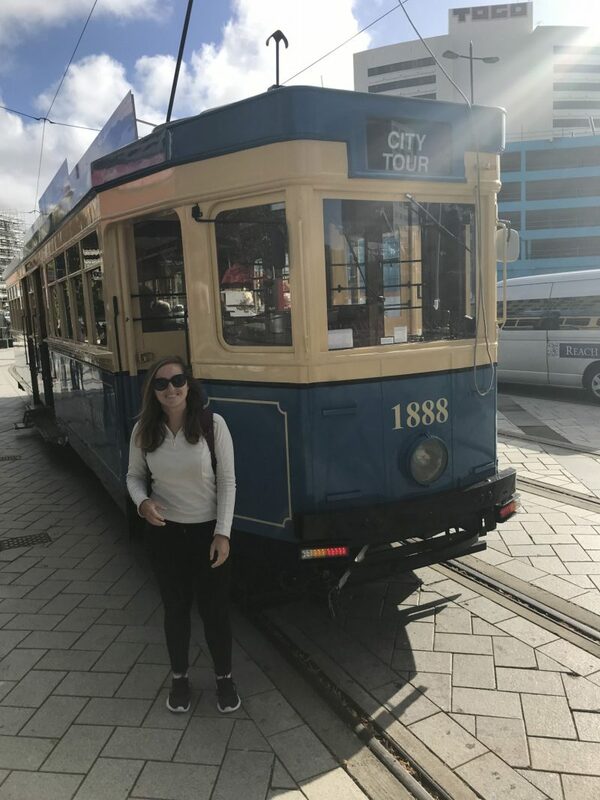 Since we didn’t get that much time in Christchurch, we decided to take the tram to get a better view of the city. We paid 25 dollars for an hour long trip through the city. It was a nice way to get around, but we did feel like it was a bit overpriced. 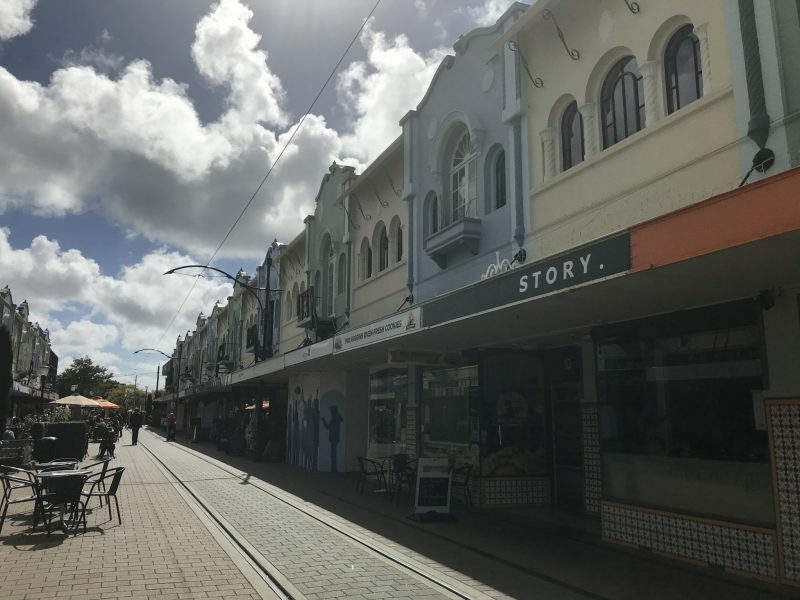 One of the highlights of Christchurch was New Regent Street. This is a small street full of colourful houses and cosy bars and cafe’s. Definitely a must-see when in Christchurch. Other than that, we didn’t do much except for trying very good street food on Cathedral Square and enjoying some drinks in the feeble autumn sun. We were now ready for some more summer, which was perfect since our next stop was Bali! Read more about that in my next blog.